Summer is swimming. It’s zucchini growing huge, tomatoes turning red. Bushels of peaches and pints of blackberries. Lazing on the patio. Boating on the lake. Vacations. Ice cream. Long days. Bright flowers. Camping. Barbecuing. Thunder storms. Beaches. Sunglasses. Shorts. It’s interesting to me how we have sets of words for every season — the things that make us appreciate this time of year before it drifts into the next. How there are certain markers we watch and wait for, anticipating the full sensory experience behind a word like peaches. 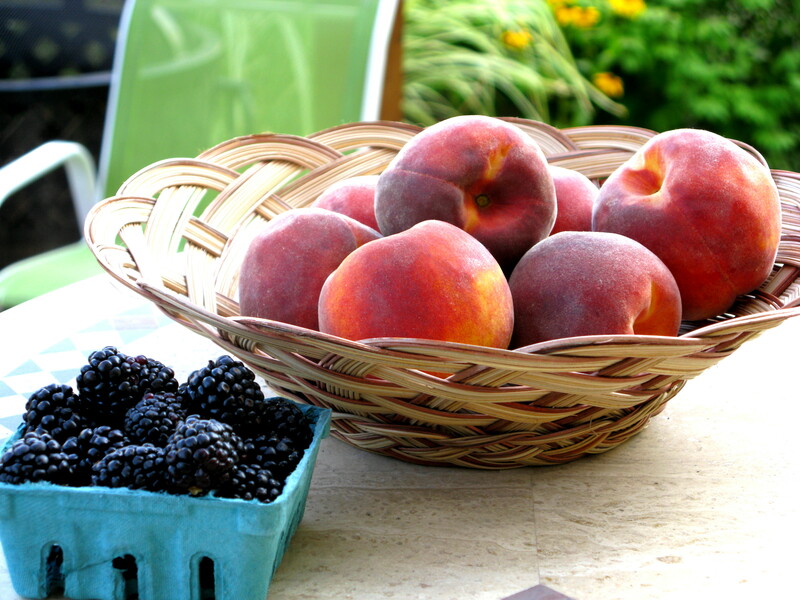 Today the farmers market pulled me into summer with the peaches and the blackberries. I’ve been waiting since Christmas time to try a peach-blackberry crisp suggested in a book I got over the holidays, and now the season is here! I thought I’d make homemade vanilla ice cream to go with it, but I ended up with so much fruit that now the ice cream that’s hardening in my freezer is peach instead. Maybe it’ll be a peach overdose, but the season is so short that we might as well enjoy it while it lasts. It also interests me how, even without a photo to go along, just the words of a recipe can win me over — how the words translate into flavors in my head and my brain can imagine the flavors melding and estimate the final result and judge based on nothing but words whether or not I’ll like it. I figured that even though this is a blog about reading, writing, and teaching, I could stretch it a bit to share a taste of summer with you: two recipes that I’m preparing tonight while a lovely, booming summer rainstorm gathers outside. Beat the eggs with the honey. Puree the peaches and add to egg mixture. Stir in cream, vanilla and salt. Pour into ice cream maker and let it do its thing. *If you’re nervous about raw eggs, you can cook them with the honey and cream on the stove, simmering and stirring until the mixture coats the back of a spoon, before combining with the peaches. Just make sure it never boils. I’ve tried making ice cream either way (raw or cooked) and love both types. Variations: Substitute other fruit purees, equaling roughly 2 1/2–3 cups, for the peaches. For chocolate ice cream, omit peaches, increase to 4 eggs and 4 cups cream, and add 1/4 cup cocoa powder. Fill any size casserole dish (I prefer a 9×13 so there are plenty of leftovers) with desired amount of peach slices and blackberries. Dust with flour and pour honey or maple syrup all over, then stir to coat fruit. Cover with granola. Drizzle butter over granola. Bake at 350 for 30–35 minutes. What are the words you associate with summer? What are the sights, tastes, sounds, smells or textures that bring the season into focus for you? Yum! Those do sound delicious. Now I may just have to run to the farmers’ market. Peaches! I’m headed back for more this week. Had peaches in my oatmeal this morning along with a couple raspberries (used up all the blackberries on the crisp). Fantastic! Peaches, fresh from the farmer’s market. Yup, I went. I ate. I savored. Sigh. And now I keep going back for more. Can’t stand to be without them while they’re in season! Don’t want to miss out. wow you really do know how to appreciate the little things,. so detailed so descriptive i can practically taste every delicious treat you described.